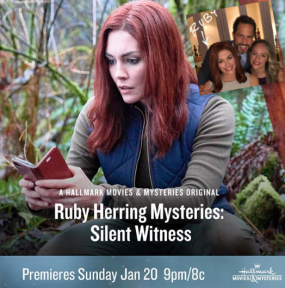 The Hallmark Movies and Mysteries Channel’s newest entry is Ruby Herring Mysteries: Silent Witness, starring Taylor Cole (The Originals and Salvation) as a consumer news reporter on a Seattle TV station and Stephen Huszar as her reluctant homicide police detective ally, Jake Killian. Ruby, her parents, and sister are staying at a luxurious spa hotel for a week while they prepare for her sister Charlotte’s (Alyson Walker) impending wedding. They are also visiting her mother’s (Debra Donohue) old friend, Sugar (Stellina Rusich), the CEO of an organic bakery empire, who is the keynote speaker at a conference the hotel is hosting. When Ruby and her sister find Sugar’s niece trying to pull Sugar’s limp body from a creek, the police at first call it an accidental fall down the adjacent cliff side, but Ruby isn’t so sure that Sugar’s drowning was really an accident and proceeds to investigate along with her dad’s (Shawn Christian--Famous in Love, Days of Our Lives and recently in an episode of The Rookie) and sister’s help. Ruby keeps butting heads with the good looking and smart detective while trying to convince him it was really murder. The mystery plot is well done with lots of suspects including Sugar’s estranged husband and an old mentor who taught Sugar all about organic baking. The characters work well together, and the red herrings will keep you guessing right to the exciting and surprising ending. I highly recommend this new series and am looking forward to the next installment. 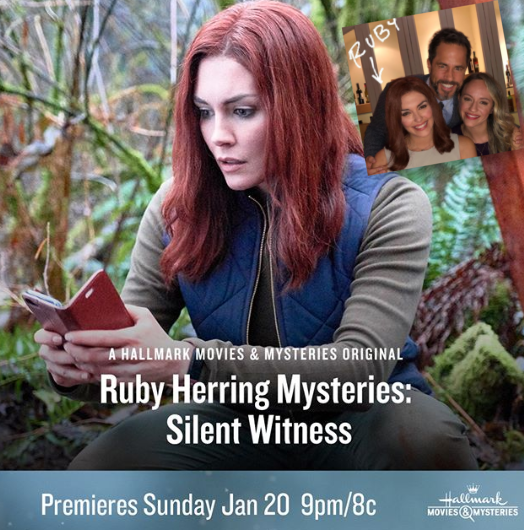 You can check out KRL’s reviews of other mystery movies on the Hallmark Movies & Mysteries Channel in our mystery section. You can also check out the Hallmark Movies & Mysteries Channel website to learn more and check out their schedule for more new movies coming soon. And join our mystery Facebook group to keep up with everything mystery we post, and have a chance at some extra giveaways. Don’t forget to check out KRL’s new mystery podcast which features mystery short stories and first chapters read by local actors!